EnduRacers Modding Team and the Gentlemen Racers are proudly releasing the Service Pack 3 dedicated to the Endurance Series mod for rFactor. The package includes 9 brand new models, reproduced accurately with lot of details for a perfect immersion. You will enjoy the diversity added to the mod, with new cars in all 4 main classes, with a lot of different new engines and new sounds. The package includes in addition an overall improvement of the physics of all the cars included in the mod, and for the sounds of several cars already released. Graphics - Added new menu design. Graphics - Added new intro video. Graphics - Added new helmet 3D Design. Graphics - Added 200+ skins of the 9 new models. Graphics - Added helmet paint shemes of numerous real drivers. Graphics - Corrected pace car graphics with working lights (thanks to Taranis). Sounds - High quality sounds for the 9 new cars. Sounds - Improved sounds for the following cars : Audi R10, Creation CA06, Epsilon Euskadi EE1, Peugeot 908, Acura ARX-01, Porsche RS Spyder, Aston Martin DBR9, Corvette C6R, Lambourghini R-GT, Saleen S7R, Ferrari F430 GT2, Flat6 GT3, Oreca FLM09. Sounds - Alternate sounds in update for the following cars : Acura ARX LMP2, Ginetta Nissan LMP2, Lola B10/80 HPD V6 LMP2. Physics - High fidelity physics and damages behavior for the 9 new cars. Physics - Overall improvements on car physics (including updates on v1, SP1 and SP2 cars). The templates and 3D scenes of the new models are in works. We will diffuse them in 1 month. 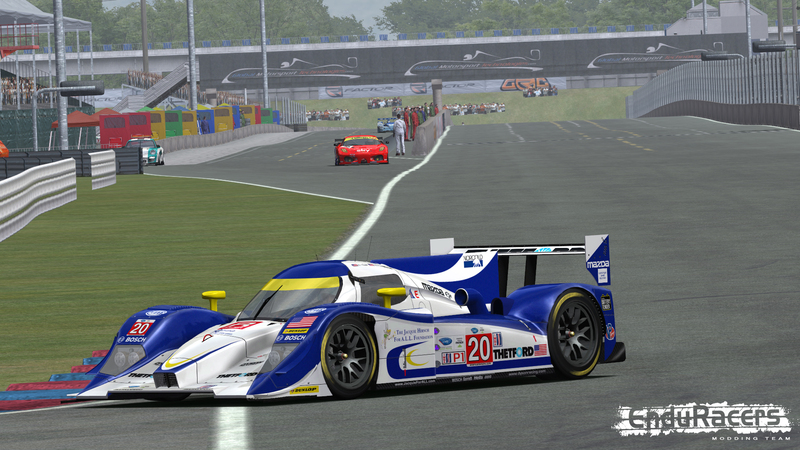 - If you downloaded the Endurance Series SP3 Patch, You need the ES rF1 version previously installed. Install it in your rFactor main folder.